It’s that time of year again! Warm weather is upon us and is bringing us all out of that winter slump. Best of all, we are starting to spend more time outdoors. Unfortunately with that comes the need to start checking our pets and loved ones for ticks. 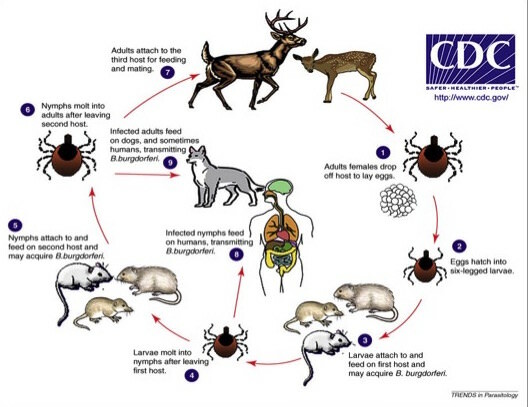 Ticks are common ectoparasites, organisms that live on the outside of an animal host. Ticks feed on the blood of pets like dogs and cats and, in some cases, humans. While tick bites cause only mild irritation, ticks can carry diseases that pose a serious threat. These diseases can be transmitted through a tick bite. Ticks carry more than 20 known diseases-causing microbes, which are called pathogens. Due to changes in weather patterns, ticks are becoming common in areas where, previously, they were absent or rare. They are bringing pathogens with them. The most common disease carried by ticks is Lyme disease, which is caused by the bacterium B. burgdorferi. Lyme disease is carried by blacklegged tick. All the hard tick (identified by having a hard “plate” on their back) the have 4 stages in its life cycle, namely egg, larva, nymph and adult (figure 1 step 1,2,4,6). An individual tick is not born with these pathogens. Instead, it can acquire them when feeding on the when feeding on the blood of an infected animal. Ticks cling to hosts when animals or humans walk through long grass, bushes, and brush. 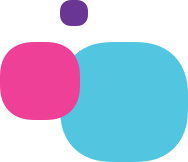 A tick feeds on a single host during a particular life stage. After it has finished feeding, it falls off the host and molts, entering the next life stage. If the larva or nymph attaches to an animal (Figure 1 step 3 through 5) infected with a pathogen, it will acquire that pathogen and, in subsequent life stages, it will be able to transmit the pathogen to pets and humans (figure 1 step 8,9). Thus the chances that a given tick is carrying a pathogen are highest in an adult tick as compared to a nymph. Tick larvae are essentially pathogen-free until they feed on a reservoir host. To be able to transmit the pathogen, a tick must feed on a pet or human for about 24-48 hours. Even though the chances of an adult tick carrying a pathogen are higher than the nymph, the latter, due to their small size, are more often responsible for transmitting the pathogen. That’s because they are difficult to spot and likely feed for more than 24 hours. Humans can not catch tick-borne diseases directly from infected dogs, but a tick that has bitten a dog can transmit these diseases if it later bites a human. We have recently started our citizen science project, Project Acari. The goal is to study ticks themselves, as well as how other factors, like climate change and the tick’s microbiome, may affect the risk of tick diseases. With your help last tick season, we were able to collect over 2000 ticks from all across the country in just a few short months! During our hiatus over the winter, we were busy developing the laboratory methods we’ll need to test lots and lots of ticks. The first challenge was to figure out whether we could detect pathogens, like the bacteria that cause Lyme disease, in our ticks. We tested about 200 black-legged ticks from Grafton area of Massachusetts, where we know Lyme disease is common and found about 62% of them were indeed carrying Lyme disease bacteria. We then wanted to see if the microbiome differed between infected ticks and uninfected ticks. We analyzed the microbiome of 128 ticks and found that certain types of bacteria were either more or less common in infected ticks, suggesting the microbiome might be affecting the capacity of a tick to carry the Lyme disease bacteria. If true, this could lead to new ways of controlling tick-borne diseases. To confirm these early findings, and to test all the ticks that we have received so far, we are now developing newer, high-throughput methods that allow us to quickly test a large number of ticks. We want to thank all the citizen scientists who have helped out so far! We couldn’t do this without you. We’ll be reaching out again soon to ask for your help again. We will keep you posted on what we find out!